oonaballoona™ | by marcy harriell: once i made a couch. 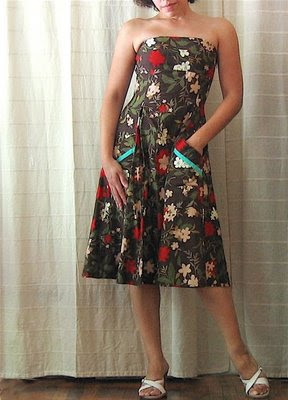 It's a shame the fabric is heavy, because the dress is super cute! I love the little touch of turquoise on the pockets. I hope it finds a loving home. Heehee... it is really cool fabric, so it's too bad the weight is off! But yeah, that would be so great if there was such a thing as virtual texture...feely...things. Would make online fabric shopping so much fun! I would just sit there all day and pet the silk velvet! I think it's gorgeous! And if it's heavy - maybe it would be nice for fall with a handknit chocolate shrug or something! 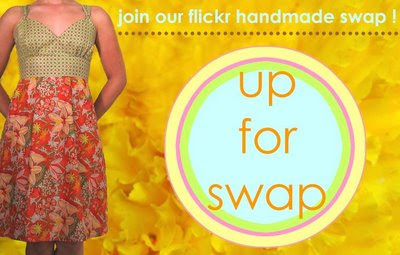 I wish I had skills so I could join your swap, but sadly I am lacking! Great idea though! Thanks for the sweet comments on my blog - I felt the hug across the blogosphere! Thanks!